Fire pits are a great way to spend time relaxing and enjoying time with friends and family around the fire. However, it’s not easy to decide what type of furniture would be practical and safe around the fire pit. The good news is Stone 2 Furniture® has the answer. 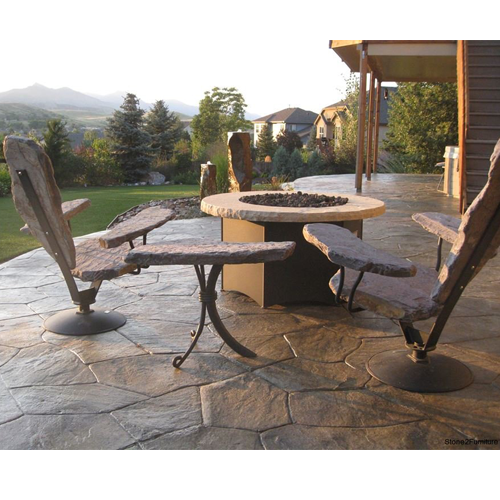 Stone fire pit chairs and tables are the beautiful, and durable answer to comfortable seating that will last for years and stand up to the wear and tear around the fire pit. Fire pits can be fun, yet potentially dangerous. Something you don’t want is flammable furniture anywhere near the fire pit. Stone Furniture is fire resistant and will stand up to the smoke and heat that can damage other furniture. Cooking around the fire pit can be fun and tasty, but also messy when roasting marshmallows and making s’mores. No worries for the Stone Furniture as spills will wipe right up, and burns that might happen from hot pots and scorching marshmallow sticks will leave no mark. It’s also adult safe when having cocktails and socializing. Smoke and suet can ruin fire pit furniture. Stone Furniture will not pick up any odors from the smoke and a quick spray with the hose will keep your furniture clean and beautiful. No need for expensive cleaners or even elbow grease. Perhaps the biggest advantage in having Stone Furniture is the ‘set it and forget it’ feature. You don’t have to worry on the windy days that your will blow your furniture away, or that you will have to store your furniture for the Fall and Winter. Once you place your Stone Furniture it is there to stay for years of enjoyment and pleasure. There is no need to store it during the off season as Stone Furniture will add beauty to your outdoor space at any given moment, extending the time you can enjoy your fire pit. Stone Furniture is the answer to your fire pit needs when it comes to long lasting, durable and beautiful furniture. It will continually add to the beauty of any fire pit setting and give you years of comfort and joy.